Dental implants in Las Vegas are a brand new technology that are designed specifically and specially for your oral care needs. Before the development of dental implants, dentures were the only alternative to replacing a missing tooth or teeth. However, dentures do not have the same functionality and versatility of dental implants. Not only should you consider dental implants, you should consider dental implants from the best dental implants Las Vegas has to offer at Pointe North Dental. Dental implants are synthetic structures that are placed in the area of the tooth usually occupied by the root. Dental implants are anchored to the jawbone or metal framework on the bone and act as a foundation for an artificial tooth or permanent bridge. In some cases, dental implants can be used to attach dentures. Not everyone is a candidate for a dental implant, however. For a successful dental implant to take hold, a candidate must have proper bone density and have a robust immune system. In all cases, dental implants require strict oral hygiene. Surgery is necessary to prepare the area for a dental implant and place the implant in the mouth. Following the procedure, a period is required for the dental implant to take hold and for bone tissue to build up and anchor the device. 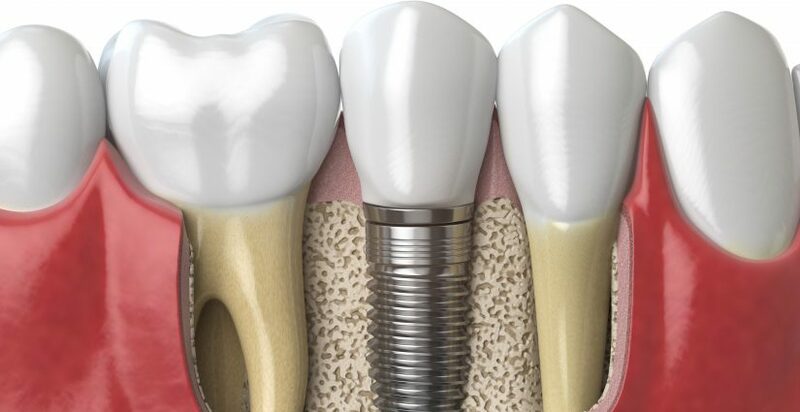 In some cases, metal posts are inserted into the dental implant during a follow-up procedure to connect the tooth. Because dental implants require surgery, patients are administered anesthesia and, if necessary, antibiotics to stave off infection following the procedure. Like any restoration, Las Vegas dental implants require diligent oral hygiene and proper care to ensure they last a long time. Dr. Raymond Kim and his dental team at Pointe North Dental are the experts when it comes to dental implants and cosmetic dentistry. If you’re looking for the best dental implants Las Vegas has to offer, look no further than Pointe North Dental and its two Las Vegas locations. For more information about dental implants, call our Las Vegas, NV offices at (702) 396-9924 and (702) 515-7737!